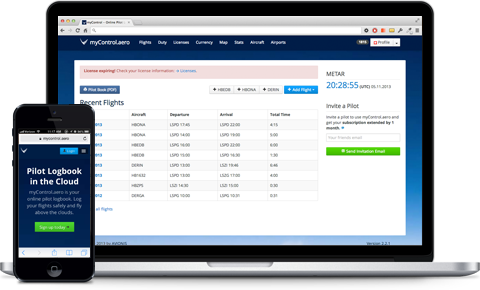 myControl.aero is your online pilot logbook. Log your flights safely and fly above the clouds. Log your flights in your web browser or with your mobile device. No software installation is required. Your data is stored on our secure servers and available on all your devices. See your takeoffs, flights and landings on a map. The interactive map gives you an overview of where you have been. Sophisticated reports allow you the get the full picture of your aviatic experience. Check the flight hours by type or by year. Export your data as Excel spreadsheet. Manage all your licenses online and get an e-mail notification before a license expires. Synchronize your license expiry dates with your calendar. The Recurrent Training and Checking view warns you when hitting defined limits. Currency is calculated on class (e.g. 12/12 in 12) and type ratings (e.g. 3/10 in 90 day). We have a large airports and aircrafts database containing about 20'000 airports, 8'000 aircrafts and 600 aircraft types. From the compliance tower the responsible operations manager tracks the status of all pilots: duty time, licenses, recurrent training & checking. The compliance with internal and external statutory regulation is proactively monitored. The myControl.aero API opens the platform for third party tools. Developers can integrate myControl.aero with their own applications. Via the API you can add new flights, change flights data or export all flights data.